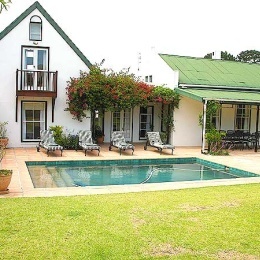 4 bedroom holiday home situated in Constantia, the upmarket residential area associated with a number of world class wine estates in Cape Town and the beautiful Kirstenbosch Gardens. The Old Winery, which adjoins the gardens of Brookhill, is an historical building which was once a Constantia winery – hence the name! The Old Winery has now been restored to provide a very comfortable home with an abundance of character. The house itself is all on one level, other than a loft area over the main bedroom. There is a very light and spacious double height living room with dining area, a pool side room with built-in barbeque (perfect for al fresco summer meals), a separate television room and a fully equipped kitchen. The Master Bedroom is on one side of the home, and has a dressing area and en-suite bathroom. The remaining three bedrooms are on the other side of the living areas - there is a second double bedroom with en-suite bathroom and two further small bedrooms, one with twin beds and the other with a double bed.